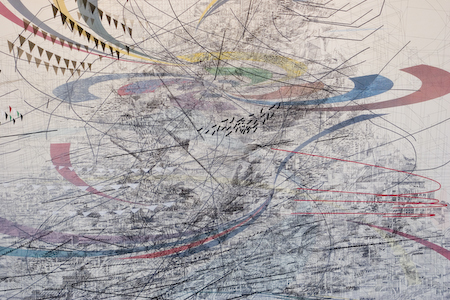 Julie Mehretu (b. 1970) is an American-based artist best known for her unique large-scale paintings. Born in Ethiopia, but raised in Michigan, Mehretu was educated at Kalamazoo College and in Rhode Island as well as studying abroad in Senegal. She now lives and works in New York. Mehretu’s shares her New York studio with her partner, also a celebrated artist, Jessica Rankin. Mehretu is represented by Christian Haye of The Project gallery in the USA and shows work with Jay Jopling at the White Cube art gallery in the UK.